Veteran’s Park is in the heart of Stamford’s Downtown Special Services District (DSSD) and is bordered by the Landmark Square office complex, a busy bus stop, and the Stamford Town Center Mall. Significant war monuments have been dispersed throughout the park to honor Stamford’s veterans, but the placement of the monuments in high traffic areas has allowed the memorial aspect of the park to be overlooked in the bustle of the urban setting. The arrangement of the monuments, trees, and hardscapes has hindered the space from having large events and created hiding places throughout the park, compromising security. A feeling of disconnectedness, lack of meaningful park use, and recent crime activity brought together a group of local business leaders and veterans as an ad-hoc committee to improve the park for the surrounding community. Northeast Collaborative Architects in collaboration with BETA Group, Inc. and CR3 LLP, was hired to work with the ad-hoc committee to develop a master plan that would honor Stamford’s veterans, improve connectivity, activate the park and accommodate a wide variety of users. Starting in February, the BETA team began leading design charrettes with the committee in a process that started with understanding the park from the stand point of the various stakeholders. The committee was comprised of a diverse selection of individuals from the Stamford community, to ensure that all concerns were taken into consideration. The BETA team conceived several preliminary design options that accommodated the varied interests of the group and culminated with a final master plan that was supported unanimously by the committee. A public meeting was held on Tuesday June 16th where the community was invited to see the master plan and offer input and feedback. The Veterans Memorial theme will encompass the entire new park, with space for quiet reflection as well as public events. 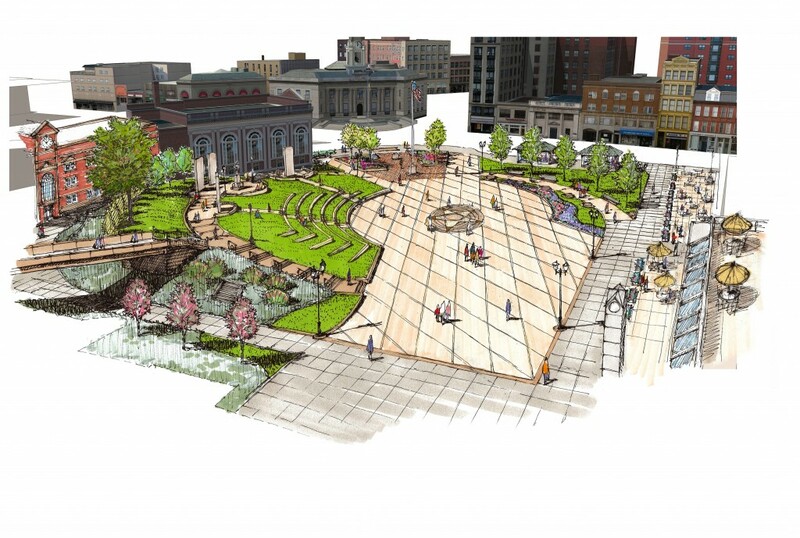 The new park will have an enhanced plaza with a five-pointed military star, representing the five branches of the military. An amphitheater built into the re-graded hillside will seat about 300 people for events, with the possibility for additional seating in the plaza that could accommodate up to 1,000. Pathways will lead up the hill to the relocated granite monoliths that honor Stamford’s war veterans, surrounded by benches and landscaping for a meaningful visitor experience. Connectivity from the bus stop to the surrounding buildings will be improved and safety concerns will be addressed with greater visibility throughout the park. While city and private funding will cover some expenses, fundraising efforts will begin this summer to jumpstart the estimated $8M envisioned total renovation. The first phase of park redevelopment will focus on creating the walkways and high ground for the monoliths, cleaning up the park, and addressing immediate safety concerns. The rest of the renovations and placement of the remaining monuments in the park will come in a later phase. The committee is excited about the master plan and eager to move forward towards their goal for a vibrant, active, and dynamic space that can be safely enjoyed by the public and Stamford’s veterans.